I keep delaying writing this review because I think my words can't do Malena justice. It's been sitting in my drafts folder for weeks. So this is a bit rambly and disjointed, for that I apologize, but I didn't want to delay any longer. Frankly, this book is too important to keep delaying. Let me hit the important points first - it is well written, very well researched and the stories of the characters display such craftsmanship and care that once you're pulled in, you can't let go of the story. That said - it is also a very difficult book to read. The longer you read, the more gut-wrenching it is. I cried through pretty much the entire last third of the novel. Malena is the story, through a small handful of characters, of Argentina's war against its own people - known now as The Dirty War. The novel is based on many real events and it reads as such. The recurring theme of "beware the fool with good intentions" plays to the heart of tragedy in the novel, and in the actual events of that period. There is a palpable, and growing, sense of dread from the first few pages as characters struggle with the question - did I just trust the wrong person? What do you do when you can't truth the organizations that are supposed to protect you - the police, the governments of other countries, even the Catholic Church? Where do you go? You go to the people you think you know - like anyone would. The characters in Malena take ever riskier chances, trusting people they never thought they would, as they realize they can't save the people they love without help. Captain Diego Fioravanti is a man trying to survive, protect the woman he loves, Inez Maldonado, and to escape the Argentine army. Kevin "Solo" Solórzano, a former suitor of Inez, is an American interpreter, traveling with the OAS (Organization of American States) Human Rights Commission to investigate the treatment of prisoners in Argentine jails. They must all trust unlikely allies and uncover the truth about events in Argentina to save the people they care about. "Governments, international organizations, NGO's and scholars continually churn out books and reports on human rights. Few people other than experts, advocates and officials of various kinds ever read these publications, invaluable as many of them are. They are to be found mostly in specialized libraries, not bookstores for the general public. "Fiction, paradoxically, is the closest thing we have to real life. It's where readers can put themselves in the characters' shoes, occupy their heads and hearts, feel their emotions. On a subject as fraught with drama as human rights, a novel is particularly well suited to involve the reader. Over time I realized that I wanted to write a gripping, entertaining story, a thriller about a serious, sobering subject." He's right. Reading page after page of documents detailing the atrocities of the Dirty War is horrible, but in many ways lets us keep our distance as facts are related coldly, one after another. In a novel, we develop emotional relationships with the characters while we read and their stories become personal - not just statistics and facts on paper. Malena is worth the work to read - these are stories we need to hear. 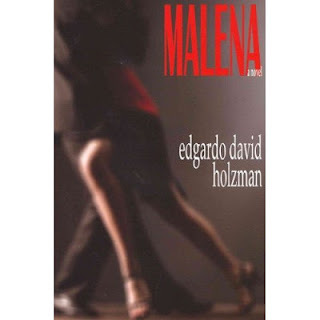 If you read Malena, it will change things for you when you visit Buenos Aires. Although I didn't take part in a "Torture Tour" when I visited Buenos Aires this past Autumn, I did hire a very knowledgeable and compassionate tour guide (Maria Lelia Ivancovich) to take my travel companions to some of the sites of Argentina's Dirty War. I encourage tango visitors to Buenos Aires to at least see some of the sites. Once you do, once you know even a little bit of the story, you see the scars of the Dirty War all over the city, in the contemporary art and music. Another thing becoming familiar with Argentina's past did for me was make me even more painfully aware of recurring themes in our own news headlines in the US. Every time I hear the phrase "enhanced interrogation techniques", it makes me feel sick in the pit of my stomach. Every time we give up more freedom in the name of safety against "terrorists", every time we meddle in the affairs of other countries (as we did in Argentina and with our support of Operation Condor), I wonder if it's possible for us to learn from the past. That's why reading books like Malena, no matter how uncomfortable we have to get to relate to the stories, is so important. Malena is part of the Argentina history and part of history of all Latinoamerican countries, from Uruguay, Chile, Guatemala, to Brasil and the rest. Also, something frequently that we don't discuss here in America is the role (positive and negative) of the US on the rest of the continent. As a novel is very touching and very intense. For myself I consider that the book reflects my story and the conflicts that lay always in front of you. Thanks Mari for the review. You captured exactly what I felt while reading Malena -- thank you, thank you, for such a wonderful review. The idea that fiction can be more touching and more effective in sharing an experience is really powerful. No wonder so many cultures have such rich, vibrant oral traditions.